6. DEREK LAM 10 CROSBY Silent St.
First up is the Madam C.J. Walker Beauty Culture Scent & Shine Coconut Oil. This little bottle comes complete with a dropper. It’s a lightweight hair oil that softens hair, adds shine, and tames frizz. It smells nice sweet vanilla. I love anything coconut so I’m pretty excited to give this a try. The Drunk Elephant T.L.C. Framboos™ Glycolic Night Serum is the cutest little bottle. The name is kinda cool too. It’s a 12 percent glycolic night time serum that refines and resurfaces skin by gently dissolving dead skin cells while supporting natural collagen. It sounds pretty great, but I have a feeling that it won’t get along with my sensitive skin. So I’ll be passing this on for sure. The Farmacy Skin Dew Hydrating Essence Mist & Setting Spray is a hydrating essence mist that tones skin, restores radiance, and freshens makeup. I’ve seen this around and have been curious about it. I’m glad that I finally get to test it out. I don’t really wear gloss, but I guess it couldn’t hurt to test out The Estée Edit Flash Photo Gloss. If you’re going to include such a tiny lip sample, you should probably fill it up all the way. 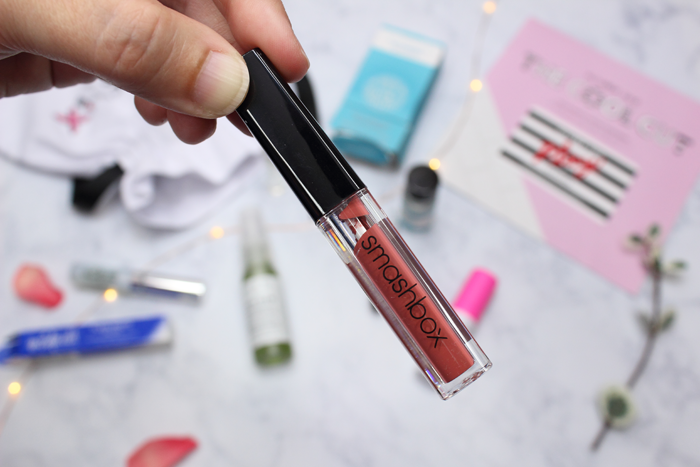 Other than that the Smashbox Always On Matte Liquid Lipstick looks pretty nice. I received the shade Driver’s Seat which is described as a warm pink. 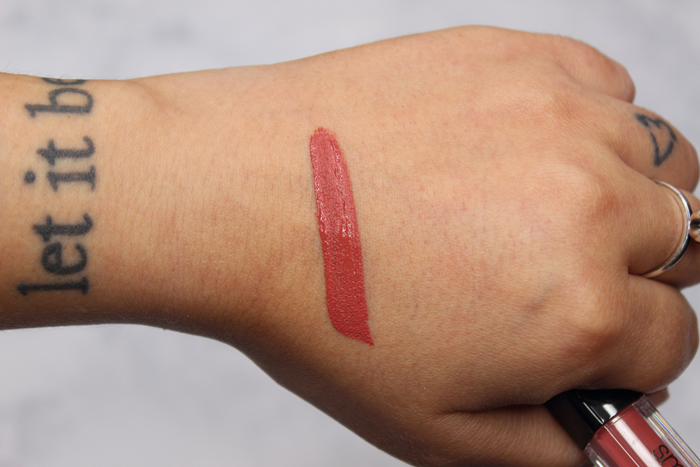 The applicator is very easy to work with, but it’s kind of difficult to remove from the tube. You really have to pull hard. It’s nice and creamy and dries down pretty quickly. I’ll have to work this into a look soon. Overall it’s a pretty decent box. And I’m sure I’ll get use out of most of the items. Let’s talk holiday collections! I don’t remember being this excited last year about holiday collections. In fact I don’t think I purchased a single item from any of the holiday collections last year! Nothing really jumped out at me. This year? I’m going to break the bank for sure! ColourPop and their beautiful Hello Kitty Collection. Wet n Wild’s Sequins and Stardust Collection. MAC Nutcracker Collection. 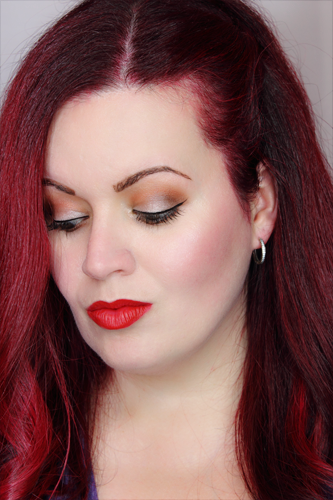 And the It Cosmetics Holiday Collection! I didn’t even know that It Cosmetics would be releasing a holiday collection. So you can imagine how surprised I was when I opened the box and saw these beauties! 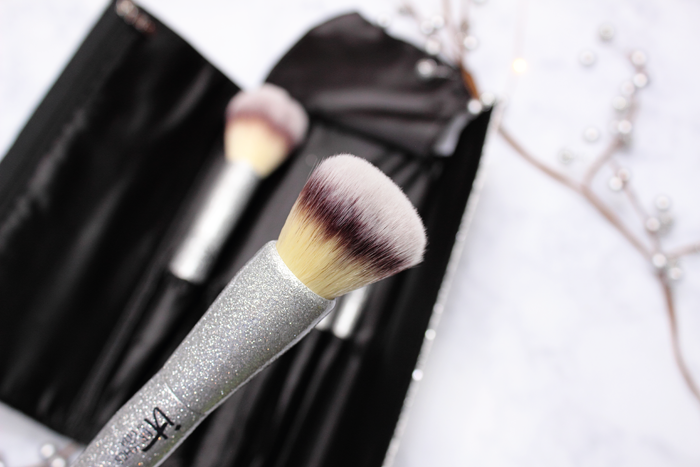 By now I’m sure you all know just how much I love It Cosmetics brushes! They are some of the softest brushes I’ve ever used. They’re so gentle on my sensitive skin. 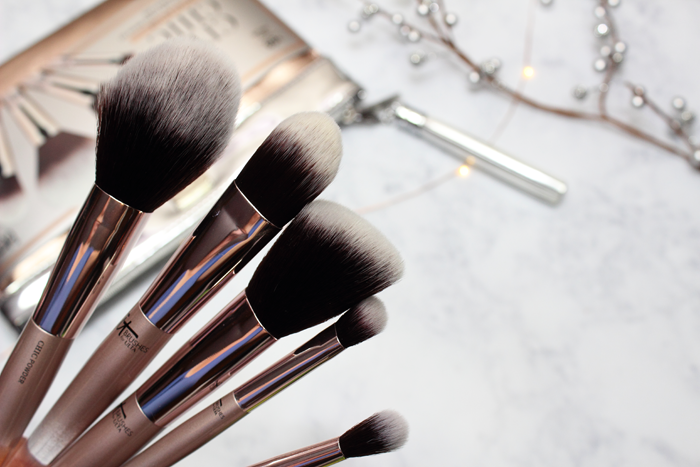 They’re easily my most reached for brushes. And I cannot say enough good things about them. What could make them better? How’s about glitter? But don’t worry! It’s not as messy as it sounds. It’s coated so the glitter doesn’t flake off. This set is all kinds of glamorous! Rose gold seems to be pretty popular these days. And I can totally see why. It’s beautiful and elegant. 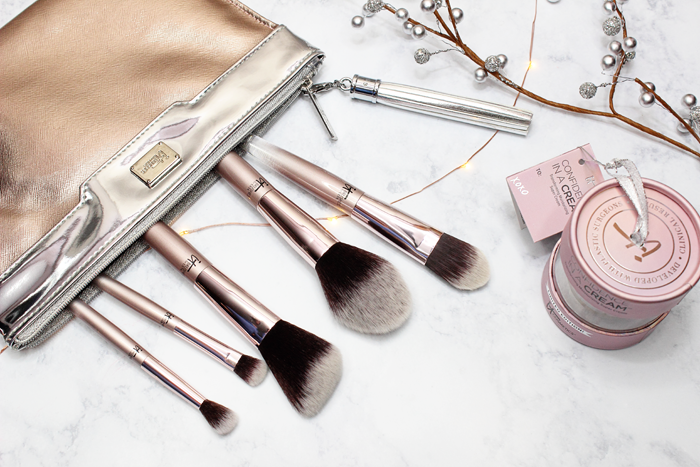 The City Chic Brush Set is tucked inside the cutest rose gold bag. The tassel is removable so that the bag can be used as a clutch. 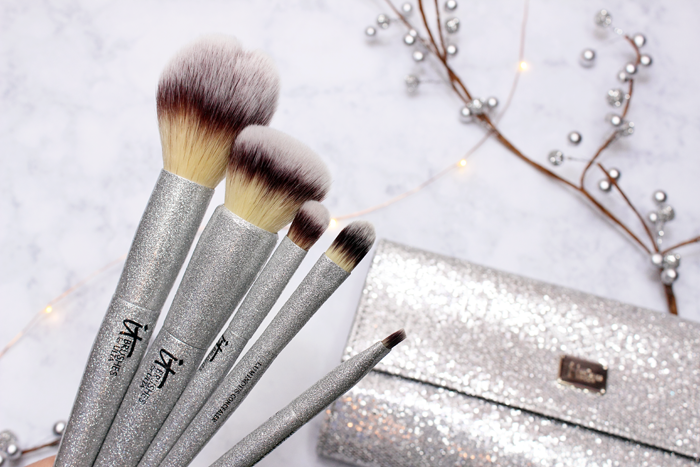 The brushes have an ombre rose gold handle and are just as soft as the brushes in the All That Glitters Brush Set. 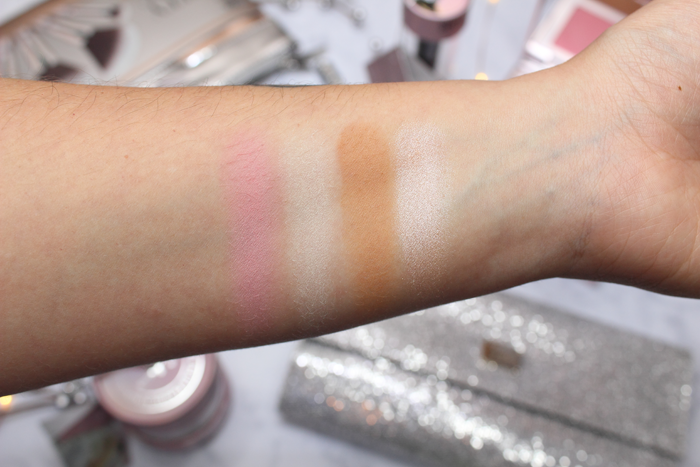 This beautiful palette contains It Cosmetic’s 4 must have formulas. 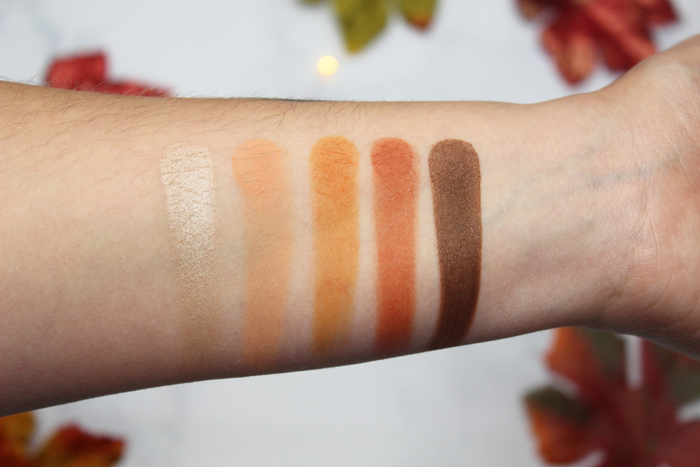 Bye Bye Pores Blush, Translucent Bye Bye Pores Pressed, Sunshine in a Compact Matte Bronzer in Warmth, and the Perfect Lighting Luminzier. Each formula is infused with hydrolyzed collagen silk, peptides, and Perfect Lighting Technology to illuminate, revitalize, and improve the appearance of your complexion. All packed inside the prettiest pink case complete with a mirror. 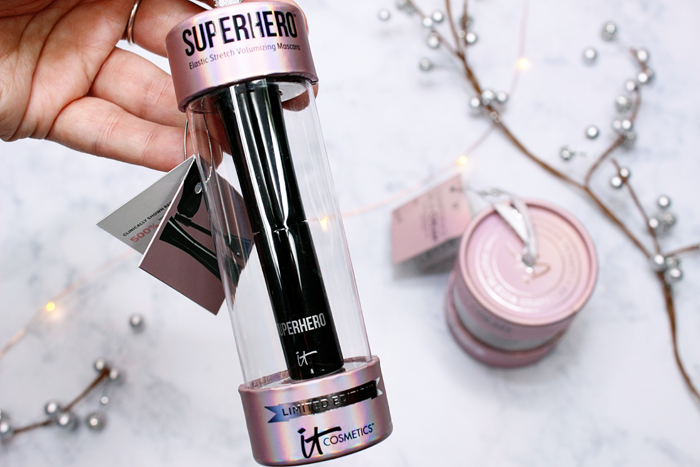 This cute decorative ornament contains a mini sized version of the Superhero Mascara. 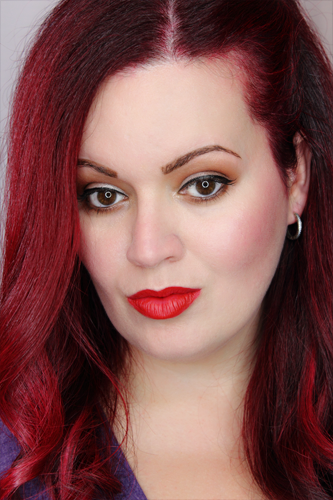 I really like this mascara and have used it in quite a few looks. You can read my full review here. This cute decorative ornament contains a mini sized version of the Confidence in a Cream. I’m still testing this out. What I can tell you is that so far it hasn’t negatively affected my sensitive skin. It’s thick and creamy. It does has a rather strong scent that lingers a bit. It’s kind of citrusy. Scent issues aside, so far I’m liking it. Overall I have to say that this is a great collection. The brush sets would make great gifts. I know I was extremely happy to receive them. 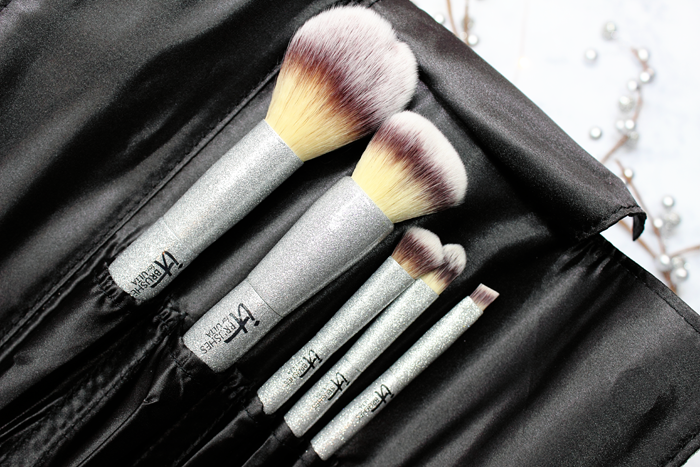 The brushes are amazing and you seriously can’t go wrong with them. 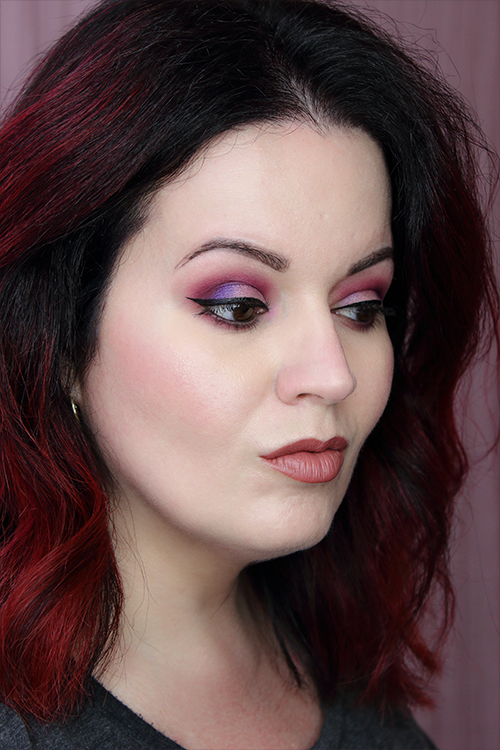 The face palette is really pretty. I can see this coming in handy for when I travel this holiday season. 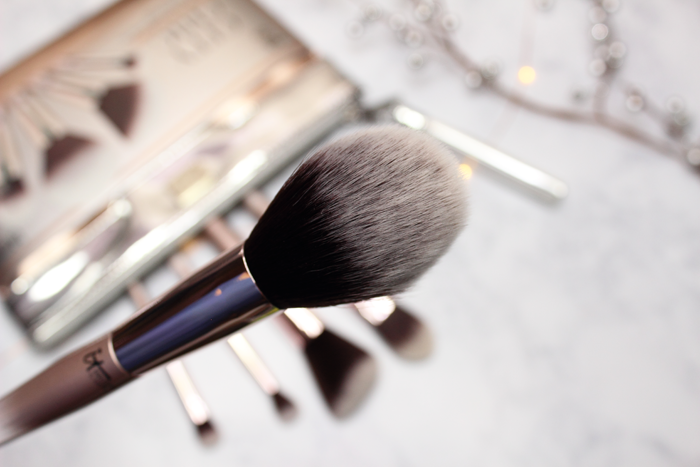 No need to pack up a blush, bronzer, setting powder, and highlighter. 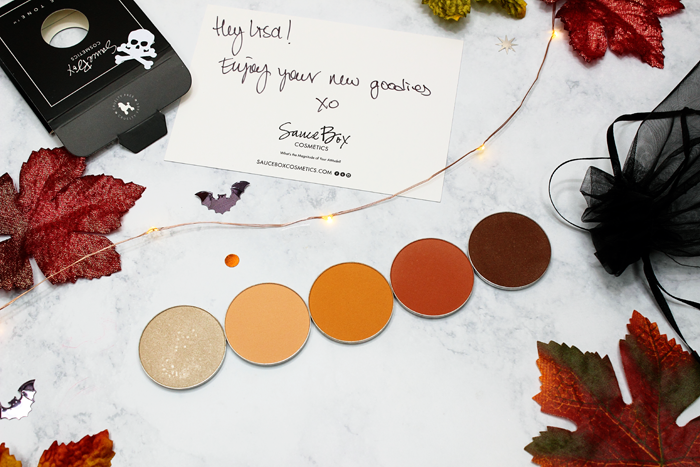 This one palette will cover all of my bases. And I already use and love the Bye Bye Pores Powder. I’m curious to see how the pressed compares to the loose. The ornaments are a really nice touch. In my family we have a tradition where every year each of us gets a new ornament. We usually choose something that reflects or stood out during the year. These will make a great addition to our tree this year. I also think it’s a great way to try the items before purchasing the full size. You can purchase these items at Ulta (online and in stores) and online at It Cosmetics. Last I checked all of the items were available online. The brushes are Ulta exclusives. You have to search for the brush sets by name. They don’t show up under the It Cosmetics Holiday Collection link for some reason. Does anything catch your eye? 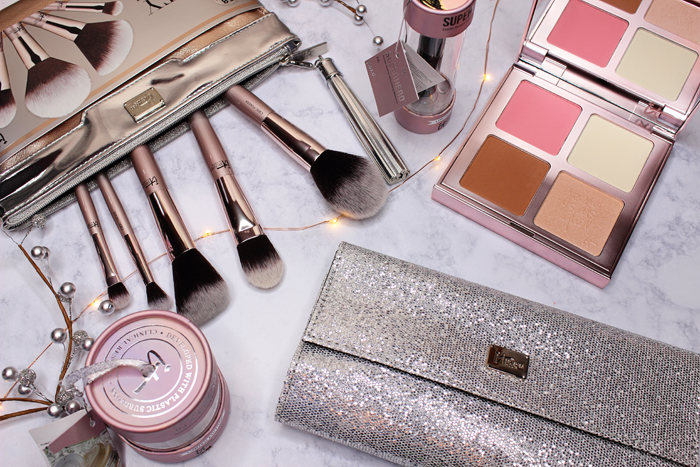 What other holiday collections are you eying?